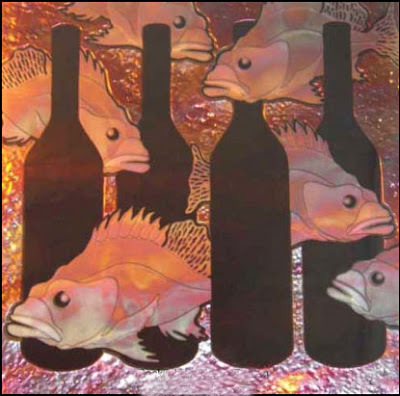 Todd Robinson is a self taught glass artist currently living and working out of his studio in Port Alberni, B.C. After 17 years as an artist / fabricator in the architectural signage and graphics industry on the Lower Mainland he moved to Vancouver Island to start his own home-based business Cascadia Glass Studio in 2007. In his art he tries to capture the intense beauty of the West Coast and bring it to life on glass. Having been born and raised in the Pacific Northwest has brought a unique flair to his style of glasswork, from intricately detailed coastal panoramas to funky marine-life decor pieces. His largest major work to date was in 2009 when he was commissioned as the glass artist to carve the First Nations designs into the 20 panels featured in the cedar and glass sculpture on permanent display at the Richmond Skating Oval for the 2010 Olympic Games. Todd works closely with his clients from original design concept to finished artwork to ensure that each piece reflects their own personal style and taste. Cascadia Glass Studio is located in the scenic Alberni Valley on Vancouver Island surrounded by the mountains, forests and coastlines that inspire Todd's art. Visitors are always welcome to come by and to view the works both finished or in progress and see the technique involved in creating a piece of art on glass. The possibilities and uses of etched and sandblasted glass can be endless. Doors, windows, partitions, showers, mirrors, signage, storefronts or maybe a piece of art to hang on the wall are just a few of the options. Whatever your idea is we are here to help you achieve it. Whether it be the subtleness of surface etching or the intensity of deep carving, the versatility of sandblasted glass when combined with light will produce a stunning showpiece for your home or business.